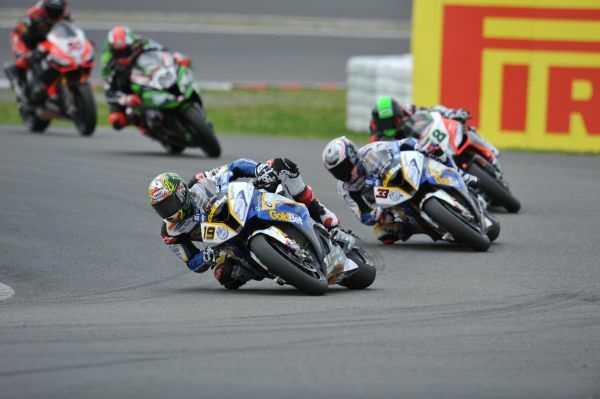 The BMW Motorrad GoldBet SBK Team celebrated a successful home round at Nürburgring (GER), including a victory and four podium finishes in total. Factory rider Chaz Davies (GBR) won the second of today’s races with his BMW S 1000 RR after finishing third in race one. His team-mate Marco Melandri (ITA) finished second and third. Thus, the team set a new record: for the first time ever in the FIM Superbike World Championship, BMW Motorrad had both riders on the podium in both races. In addition, Chaz claimed the fastest lap in race two. Collectively, Chaz and Marco achieved 77 points today, equaling the best ever result of BMW Motorrad in the series. 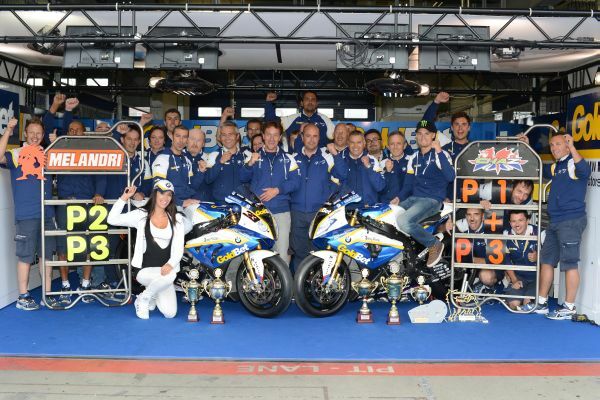 After ten of 14 rounds of the season, the BMW Motorrad GoldBet SBK Team is second in the Team standings with 478 points. In the Riders’ classification, Marco improved to third with 257 points, reducing the gap to the front to 30 points. Chaz is fifth with 221 points, 66 points behind the lead. In the Manufacturers’ ranking, BMW is third with 321 points and a gap of 48 points to the top. In race one, both BMW factory riders had a good start to lay the foundations for a strong result. Marco, who came from second, took the lead shortly but then dropped back to second when he was overtaken by Tom Sykes (GBR). Chaz, who started from sixth, moved to third at the first corner. Throughout the race, both riders stayed in touch with race leader, Sykes. On lap 13, Chaz passed Marco to take second but two laps later Marco returned the favour. The BMW duo caught up with Sykes and in the first corner of the penultimate lap, Marco passed him to take the lead. Chaz also prepared for overtaking his fellow Brit but then the race had to be red-flagged after Jonathan Rea and Leon Camier (both GBR) had heavily crashed due to oil on the track. Thus, the ranking from the previous lap counted as the final race result, with Sykes classified the winner in front of Marco and Chaz. Race two was another thriller, with a BMW rider leading from the start to the end. It was a nail-biting fight for victory, with the top 6 close together in battle. Marco took the lead at the start, while Chaz moved to second straight away. The BMW Duo were closely followed by their competitors but also fought for P1 between themselves. On lap 7, Chaz took the lead while Marco slipped back to third on lap 10 as he was passed by Eugene Laverty (IRL). However, the Italian fought back and by the end of lap 14, entering lap 15 Marco took just a few corners to pass Laverty and then Chaz and to retake the lead. The fight was not over, as Chaz passed his team-mate again on lap 16, heading the field for the second time in this race. On lap 18, Marco lost second position to Laverty but everything was still open as the gaps were minimal. One lap later, this race also had to be red flagged due to a crash. Chaz won, Laverty came second and Marco was third on the podium. In the FIM Superstock 1000 Cup, Sylvain Barrier from the BMW Motorrad GoldBet STK Team extended his lead in the overall Riders’ classification. The Frenchman finished today’s exciting race second on the podium with his BMW HP4, missing victory only by one tenth of a second. With two more rounds to go, Sylvain now tops the ranking with 165 points and has an advantage of 40 points to his closest rival. His team-mate Greg Gildenhuys (RSA) finished 11th. In the Manufacturers’ classification, BMW leads with an advantage of 28 points. “I am obviously super happy with the victory in race two. I was already happy with my podium in race one but I knew we could improve and so we did. In race one, I made the start I was hoping for coming from the second row of the grid and I was racing in the leading group with Marco and Tom. In the early stages, Tom put some really good pace at the front. Generally, the bike was working really well as it has done all weekend. We were just slightly struggling in a couple of areas which cost me a bit on acceleration but we worked on that for race two. We definitely made a step in the right direction. I felt that my RR was a little bit better in certain areas of the track. It was still hard to brake but I tried all I could do to build a bit of a gap. It was a good battle with Eugene and Marco. The last couple of laps I just put my head down seeing if I could just get away from the guys fighting behind me. “I’ve never seen a red flag at the end of both races in my life. It was a shame because in race one I was leading and race two I was third but I am sure that it would have been a great final lap because all three of us were trying to win and everyone was pushing hard. The red flag was not on my side today and as a consequence I had no chance to make use of the opportunities we had and this is frustrating, but these are the rules. I am so sorry for the guys that crashed and got injured because they had much more bad luck than me. All the best and a speedy recovery to all of them! For sure I can be happy because we have shown that we are strong but at the same time I am disappointed because I did not get as many points as I could have. The championship is still very open and I have reduced the gap to the front. “It has been an extraordinary weekend. For the first time in the history of BMW in the Superbike World Championship, we got a ‘double, double podium’ and we are honoured to have achieved this success at BMW’s home race. The result confirms that the team is continuing to work hard and retain concentration to achieve the best possible result in this championship. With today’s victory, the sixth of the season, we matched last year’s number of wins. Both Marco and Chaz are consistently reducing the gap to the top of the overall ranking and they also demonstrated that they are able to fight for the title. This shows the strength of BMW, of the team and of our guys. “It has been a great day. Both races were very exciting and we got almost the maximum we could expect having both riders on the podium in both races. This was the right way to respond after the issues we experienced in Silverstone and I must say a big thank you to everyone at BMW Motorrad and in the race team for the great job they have done. Both crews have worked very well on improving the machines. Practice by practice we went faster in the dry and in the wet. Only unlucky circumstances prevented us from winning both races but this is racing and what we have achieved today is important.